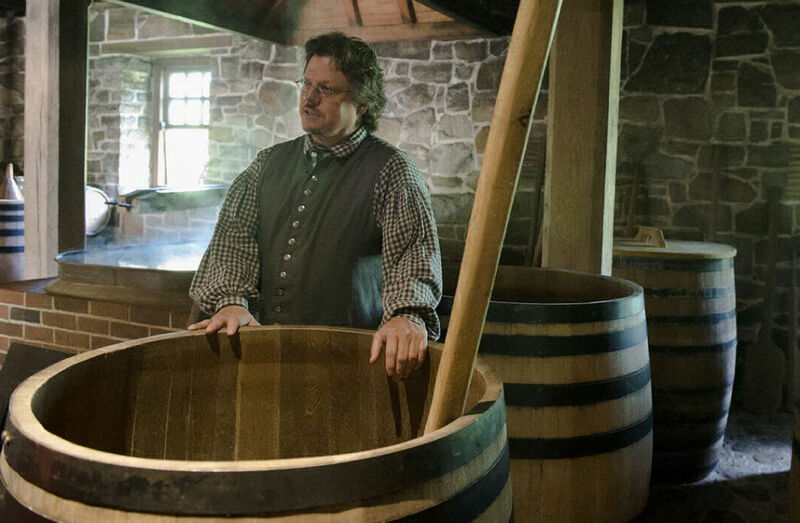 Steve Bashore oversees the production of spirits at George Washington's Distillery where 18th-century methods and recipes are used to create rye whiskey as well as peach and apply brandy. Distilling was the last commercial business George Washington entered, starting his distillery in 1797, and in 1799 it produced over 10,500 gallons of rye whiskey, making it one of the largest whiskey distilleries in the nation. The distillery was reconstructed 10 years ago based on archaeological excavations and historical records. Since 2009 it has been a fully functional distillery producing very limited quantities of Washington's rye whiskey using his original mash bill. Steve has been working to create these exceptional, historic spirits using grains milled in Washington's reconstructed water powered Gristmill. Steve and his team have been supported over the years by a number of talented distillers that have lent their time and expertise to the project. This list includes: Joe Dangler, Jimmy Russell, Dave Pickerell, Lisa Wicker, Thomas McKenzie, Fred Noe, Ted Huber, and many others.A special single malt whisky project was done in 2012, with Bill Lumsden of Glenmorangie, Andy Cant of Cardhu, and John Campbell of Laphroaig.